The Tuesday night crowd is young and hip at Studio STK in Burlington’s Old North End. Retro-punk hair, tattoos and skinny jeans appear among the 15 or so locals who endure plastic-molded chairs for two hours of “Secret Movie Night,” hosted by filmmaker and STK web designer Will Skolochenko. For the past 60 years or so, Starr has been involved with film in some way or another — as a scholar, creator, preservationist and distributor. Her conversation is studded with references to personal encounters with directors such as Roberto Rossellini and Louis Malle. Brian De Palma (Scarface) was an unregistered student in her film course at Columbia when he was in his teens, as was Peter Bogdanovich (The Last Picture Show). Years later, Starr wrote an article recollecting these two young men who were driven to conquer Hollywood. But her own interest lay, and still lies, elsewhere: with the underdog. “I mistrust power in all its forms. Power is abusive by definition,” she muses in an interview in her Old North End home. In Hollywood, power belongs to the directors of profitable feature-length films. Starr’s passion is the less marketable shorts that she has helped preserve and distribute. She’s written about them, too, in books such as Experimental Animation (1976) and Discovering the Movies (1972). Next comes a documentary short depicting a day at the racetrack, by Hans Richter. With its rapid-fire montage and double exposures, the film would look experimental to the average audience today. In 1929, when it was made, “these were shown in theaters,” Starr says, recalling the then-standard practice of showing short films before the commercial feature. The following film, by New Zealand animator Len Lye, could easily be mistaken for a piece of ’60s psychedelia. Its colors are DayGlo, searing the eye, and its images surreal: A man’s form bats a tennis ball, while an animated landscape swirls behind him. Only the jazzy music suggests an earlier era. In fact, “Rainbow Dance” is a film Lye made in 1936, as a promotion for the British Post Office. For young filmmakers and graphic artists who consider themselves way out there in 2007, these short films could be a rude awakening: People were already doing this stuff. But they’re also inspiring — and enlightening. A film called “In the Street,” by Helen Levitt, is a 1940s document of life in the working-class neighborhoods of New York. Unlike most Hollywood versions of the period, it teems with the life of a multiracial metropolis: Kids dance in unleashed hydrants, trick-or-treat, pelt each other with socks full of flour. Starr knows Helen Levitt. In fact, she knows or knew many of these filmmakers, and peppers her commentary with anecdotes about them. Harry Smith, for instance, the San Francisco filmmaker, folk music anthologist and mystic, was “a very strange guy.” Lye was “a wonderful human being.” Amos Vogel, who ran the influential 1960s film series Cinema 16, initially struck her as a “con man.” Closer to home, there’s Robert J. Flaherty, the director of groundbreaking doc Nanook of the North (1922), who died in Dummerston, Vermont, in 1951. Starr used to attend the film seminars held there each summer by Flaherty’s widow, Frances. Today, though, “Vermont has forgotten about the Flahertys,” she says. Starr’s own life in Vermont is low profile. For the past 15 years, she and Boyajian have lived in a modest house around the corner from STK. They started coming here when their grown daughter got a local job. Starr showed films at the now-defunct Café No-No. She also taught at Burlington College and served on the advisory board of the Vermont International Film Festival. The couple likes to spend the dead of winter farther south — in the Big Apple. Walking from the bus stop one day, Starr says, she came across Studio STK and ventured in. Since then, she’s volunteered to curate three installments of Secret Movie Night. On November 6, she’ll present a fourth program in honor of Boyajian’s 85th birthday, including a film he made about William Blake that features narration by Allen Ginsberg. Her excitement led to a writing job at a small magazine called Film Forum Review, then to the Saturday Review, where she wrote about 16-millimeter films and “got to know everybody.” For 10 years Starr used her column at the prestigious weekly to offer guidance to public librarians who were just starting to build film collections, after years of scorning “the pictures” as an inferior art form. Most “film distributors” are divisions of multinational corporations. For Starr, distributing films is a “cottage industry, except it was in my apartment” and a labor of love, she says. Sometimes it was a physical labor, too — to distribute a feature, she had to enlist her son to carry the reels to the post office. Many of these films were made by women, such as Levitt, Claire Parker and Mary Ellen Bute, who once had her films shown at Radio City Music Hall “on a 50-foot screen,” says Starr. In 1977, Starr wrote an article for The New York Times provocatively called “Is the Government Subsidizing Sexism in Film?” which pointed to the virtual absence of female filmmakers from federally funded exhibitions. (“The headline was not mine!” she stresses.) Not long after, with Bute and others, she founded the Women’s Indepen-dent Film Exchange. 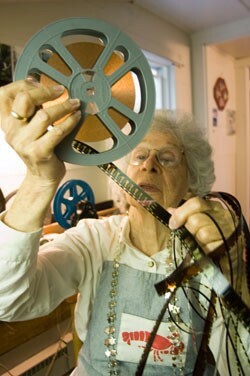 Secret Movie Night featuring films of Aram Boyajian, Tuesday, November 6, Studio STK, Burlington, 8 p.m. $3. Info, 657-3333.